On Friday October 26th, one of the world’s favorite comedians Jim Carrey, received the Charlie Chaplin Britannia Award for Excellence in Comedy at the BAFTA Britannia Awards at the Beverly Hilton in Beverly Hills. The night also included actress Emilia Clarke who received the Britannia Award for the British Artist of the Year -while Cate Blanchett received the Stanley Kubrick Britannia Award for Excellence in Film -among other honorees of the night. Presented by Jaguar, Land Rover and American Airlines, some of the night’s other guests included Viola Davis, Peter Farrelly, Piers Morgan and Joan Collins, who all came out to support the award show -and to celebrate the success of companies from the UK and the US who have helped contribute to putting BAFTA on the world stage. 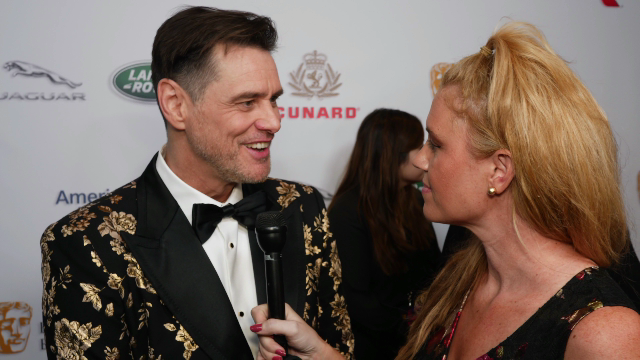 When speaking with Jim Carrey (who was very excited and grateful to be honored) about a role he would most love to tackle but hasn’t yet done -he stated ‘Shakespeare’ as something he would love to fully commit and immerse himself into -if the opportunity arises. BAFTA -a non-profit organization which supports the British film and TV industry in the US, is a way for filmmakers and actors to hone their skills, while offering workshops, screenings and scholarships along the way -and encouraging enthusiastic students and members to reach their goals in the industry, as well. A huge thank you to Caroline Stegner and Rogers & Cowan for their continued efforts and for making this such a memorable night -as well as BAFTA for all their hard work!